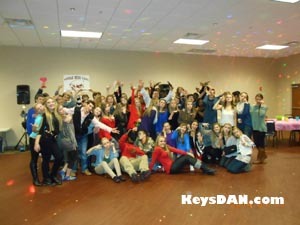 Why should you consider a KeysDAN Music Video Dance Party for your next event? 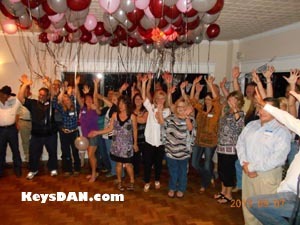 Why should you consider a KeysDAN Music Video Dance Party for your next event? 1000's of Videos to Choose from. 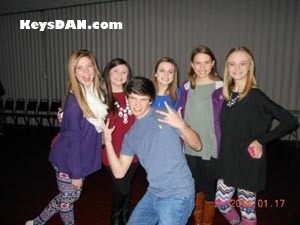 Have a Live DJ Mix Videos at your party! Music Videos are becoming one of our most popular requested services for: Quinces, School Dances, Homecomings, Proms, Sweet 16's, 18th Birthdays, Graduation Parties and other events! We offer a generous video package designed with your budget in mind! Our Music video shows combine the latest in video projection technology, music, and sound to make your party the hottest in town! 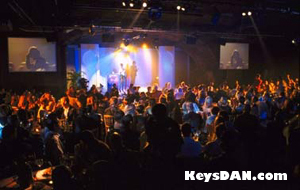 Our KeysDAN Music Video Dance Party package also includes a club-style lighting and effects show. We bring several lights that transform the dance floor into your own private club! Our Music video shows combine the latest in video projection technology, music, and sound to make your party the hottest in town! 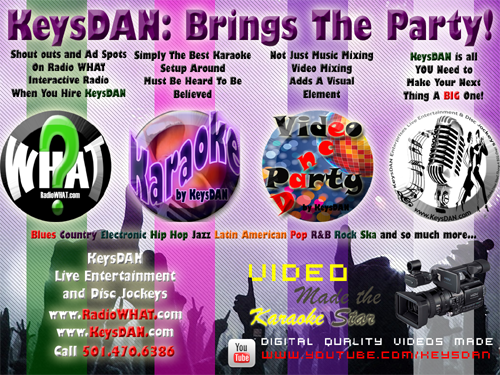 Our KeysDAN Music Video Dance Party package also includes a club-style lighting and effects show. 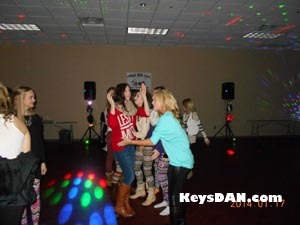 We bring several lights that transform the dance floor into your own private club! Our music video library is updated monthly and includes your favorite current hits as well as old-school classics and all-time favorite group-interactive hits such as the Cha-Cha Slide, Macarena, and Cotton-eyed Joe. All of the videos in our library are broadcast-quality and are provided to us by the very same companies as your favorite channels such as MTV & VH1. 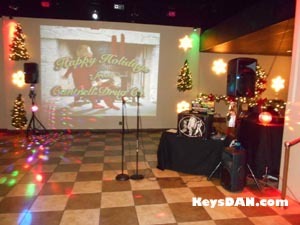 We allow you to request videos from our master music video list and of course we take and play requests at your event! We also bring our regular expanded music library for requests that may not be available on video. 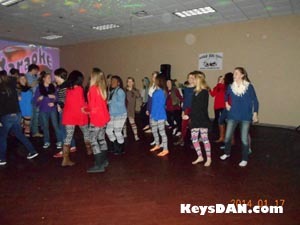 We also feature DJ dance music for your party enjoyment. Arkansas DJ, Arkansas DJs, Ar DJ, Ar DJs, Event Planner Arkansas, Karaoke Ar, Arkansas Bands, Ar Band, Little Rock DJ, Hot Springs DJ - Arkansas DJ, Arkansas DJs, Arkansas Wedding DJ, Little Rock DJ, Little Rock DJs, Conway Arkansas DJ, Hot Springs DJs, Fayetteville Ar Disc Jockey, Fort Smith Ar Disc Jockeys, Central Arkansas Entertainment, Central Arkansas DJ. 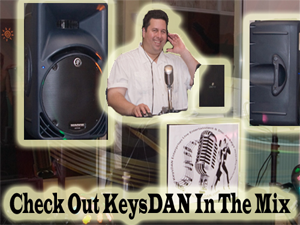 We can provide Live Bands for weddings,company functions, private parties, night clubs and local bars. If you need a Little Rock Arkansas band or bands we have the best.". Arkansas DJ, Arkansas DJs, Ar DJ, Ar DJs, Event Planner Arkansas, Karaoke Ar, Arkansas Bands, Ar Band, Little Rock DJ, Hot Springs DJ - Arkansas DJ,Arkansas DJs, Arkansas Wedding DJ, Little Rock DJ, Little Rock DJs, Conway Arkansas DJ, Hot Springs DJs, Fayetteville Ar Disc Jockey, Fort Smith Ar Disc Jockeys, Central Arkansas Entertainment, Central Arkansas DJ. We can provide Live Bands for weddings, company functions, private parties, night clubs and local bars. If you need a Little Rock Arkansas band or bands we have the best.". 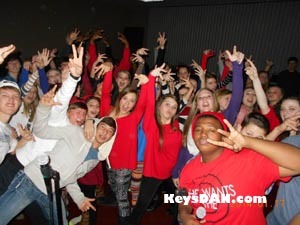 KeysDAN Enterprises, Inc. Live Entertainment and Disc Jockey Services is Your best choice for a Karaoke Party DJ for KJ music & Club engagements inArkansas DJ, Arkansas DJs, Ar DJ, Ar DJs, Event Planner Arkansas, Karaoke Ar, Arkansas Bands, Ar Band, Little Rock DJ, Hot Springs DJ - Arkansas DJ,Arkansas DJs, Arkansas Wedding DJ, Little Rock DJ, Little Rock DJs, Conway Arkansas DJ, Hot Springs DJs, Fayetteville Ar Disc Jockey, Fort Smith Ar Disc Jockeys, Central Arkansas Entertainment, Central Arkansas DJ. We can provide Live Bands for weddings, company functions, private parties, night clubs and local bars. If you need a Little Rock Arkansas band or bands we have the best. "..